Priyanka Chopra and Nick Jonas are happily married and are today hosting a reception in Mumbai for their industry friends. Many celebrities like AR Rahman, Rekha, Vidya Balan, Salman Khan among others were spotted in their best avatars. Yesterday, Deepika Pdukone’s spokesperson informed DB Post that she will be attending today’s reception and guess what? Deepika makes it to the ceremony with her husband Ranveer Singh. 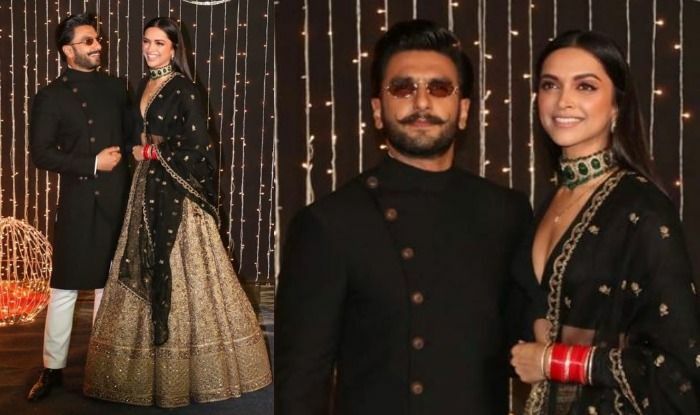 Both Deepika and Ranveer twinned in black Sabyasachi Mukherjee outfits. Just like always, the two came in front of the paparazzi and stole the limelight. In the picture, one can see Ranveer getting lost in Deepika’s smile and this candid snap of theirs will definitely make your heart skip a beat. The shutterbugs love this fire couple and as soon as the couple got down from the car, the paps went all crazy. Yesterday’s reception was hosted for PC’s extended family and the media. Bride Priyanka sported a blue embellished corset style lehenga by Sabyasachi Mukherjee. She accessorised her look with silver jewellery. With subtle makeup and hair tied in a low bun, Priyanka looked gorgeous as ever. Nick, on the other hand, donned a grey suit and looked dashing in it.